Earrings – If you are determined to buy her jewelry, but funds are tight, you may want to consider earrings. As long as you do not buy huge diamond earrings, you can typically find something very affordable. A pair of infinity hoops or vintage pearls would be nice. You will also find that many stores have earrings dedicated to this celebration, often with pear-shaped birthstones or crystals, or silver spirals, typically used to represent a mother. 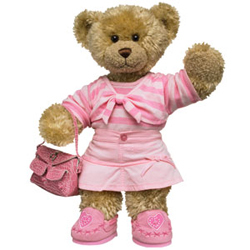 Build-A-Bear – Every woman loves Build-A-Bear, because it is a gift that comes from the heart. Anyone can go into a jewelry store and ask the salesperson to pick something out, but a bear forces you to become emotionally invested in it throughout the creation process. These stuffed animals are much more affordable than most people think. Pendant – If she already has a nice chain necklace or a charm bracelet, you can simply buy a pendant for the necklace or a charm for the bracelet that is baby or mother-inspired. Comical – If your gal never wears jewelry and is a down-to-earth person who pretty much lives in yoga wear and doesn’t see the point in buying expensive things, there are some humorous gifts you can go with. You could buy a “Poo Log” or a “Magic 8-Ball” to help her make the hundreds of decisions she needs to make throughout the day. Baby Keepsake – There is nothing in the rules made by push present etiquette that says that the gift can’t be for her, but focused on the baby. There are keepsake boxes, sand print kits, personalized snow globes or picture frames, keepsake scrapbooks, personalized silver baby rattles, hand or footprint ornaments and a whole lot more. These are basically gifts that help to capture moments that you will want to be reminded of forever.